The ad is out and I'm ready for the giveaway. Since I have two grandbabies to draw names, I have to have two gifts. Just leave me a post on which one you would like. I will divide them up into two different drawings. One of the giveaway is a little bit of everything. From going green with a bag I designed that will help you do away with the plastic bags, a Willow Tree-Mother and Son, a garden journal, Christmas CD to get us in the mood and thinking, and a scoop, just because. The other giveaway is for the creator. 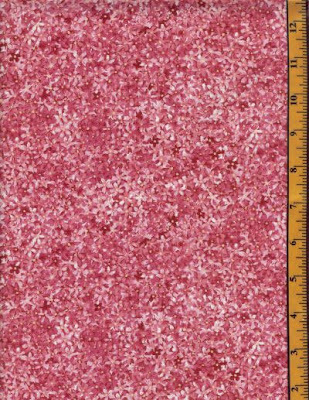 A santa panel again to get us thinking, six fat quarters from Moda, a pattern-Jelly Bellies that is great for fat quarters and also the Christmas CD. Just be sure and tell me which one you would like your name to be put in. You do not have to have a blog to enter, just drop me an email and I will post your comment for you. Deadline for drawing will be on July 15th! The magazine will be on newstands by then. A great dip or to spread on tortilla chips. I meant to take pictures of this while I was making it and forgot totally. This is the best recipe for Chili-Con-Queso. Heat in microwave until melted. Mmmmmmm good! Romantic Homes Ad In August Issue-Yea!!! I just have so much fun giving away treasures. One will be for the creative person (something to work with) and the other will be for the decorator (something to look pretty). All the details will be posted soon! Well, I just don't write many stories because I'm not a good writer, but here goes. 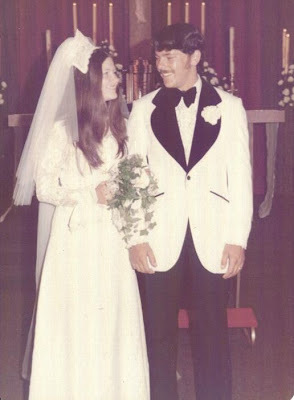 If you have read my blog about me you know I have been with my husband since birth, well it feels that way. We met in the 7th grade and you know how you pass notes and say I like you and you just hope you get one back that says, I like you too. That's how it all started. Oh my goodness he was a hunka hunka gorgeous 12 year old. At least I thought so. Time went by and we had our moments like when I told a girl his middle name and he broke up with me. I cried my eyes out and one time we played spin the bottle at one of those parties, without the other one there, that wasn't to good either. But we made it. Ya know back then those were some really big problems. I made our going away outfits. 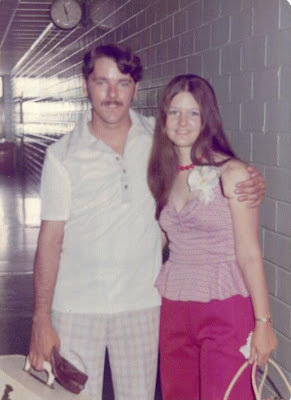 That was back when pants had cuffs on them and hubby and I didn't want anyone to know we just got married, so I took off my corsage, we went and washed the car and all of that good stuff. We stepped out of our little Toyota and rice fell all out of our cuffs at the gas station and all of these cowboys started hooting and howling. That was embarrassing. 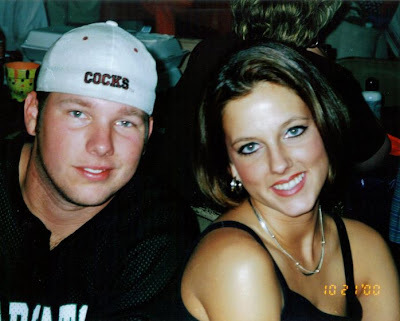 Then we had 2 great kids, I could have traded them in a couple of times, but those are some stories by themselves. I love them to death and they make me proud. Don't they look like they could cause a little trouble. Anyway our anniversary is June 22 and I'm late getting this posted because we were at our daughters house helping them. So it's late and my husband is on 12 hour shift at this time, so I kissed him goodnight and wished him many more happy anniversary's. Love that man!! Gifts for $10.00 with shipping! I embroidery towels. Well, I came up with the idea of sending a towel in the mail to that special person for $10.00, with shipping included, in a gift envelope. (See picture below). If you need a gift to be sent and are really busy or maybe forgot (we don't do that) just give me a call. All the sayings will be added to the website asap. There is some that are romantic and some will make you laugh. I'm going to have another giveaway so be watching. Diana Lyn "Soy Candle Lady"
Oh my goodness, I had a surprise when I got my mail today. Sweet Diana Lyn sent me some of her tarts and candles just for helping her out with something. Now is that sweet or what. My husband got the mail and said you got something that smells good. I bet it was hard for that package to make it to my house and it was wrapped and double wrapped. So you know they are some strong candles. Thank you so much Diana Lyn, you went overboard. You need to check out her blog. http://soycandlelady.blogspot.com/ and the website http://soycandlesfromtheheart.com/ I'm telling you they are strong scent candles that burn clean. If you haven't visited Jenny at http://wondersofwhimsy.blogspot.com/ you need to go see her talent. Her dolls are wonderful. I was looking at blogs, from one to another one, to another one. 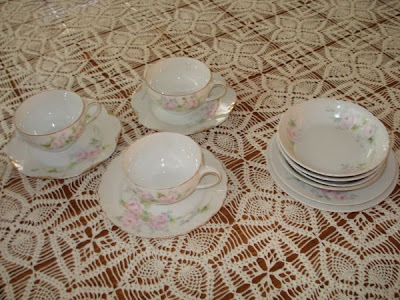 It all started with http://stitchinbythelake.blogspot.com/ post to my blog. I just kept reading and I forgot why I got online, to post my purse picture. I'm lucky I got it complete due to electricity going out today for about 5 hours and I'm in Texas. It was hoooooootttttt and I sure wasn't going to sit at my treadle machine to make it. Well here it is and I wish I wouldn't have put the frayed red material on the handle, I might take that off and just paint it. 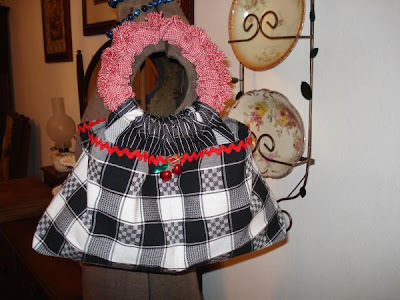 The purse is really simple to make and Stitchin By the Lake has one she has made. It's a cutie. I'm posting two purses. I finished the other one I'm putting online. This one would be great for the friend that has everything-Cottage Beach Theme. These girls are best friends. Just quilting on this side. 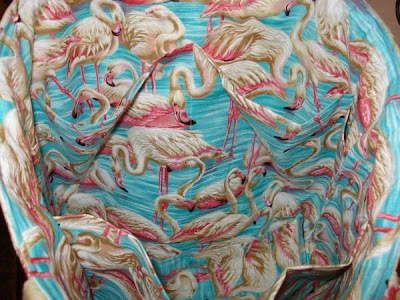 Pockets all on the inside with flamingo's . Purse to be made TODAY!!!! I thought if I post about it, I will finish it... 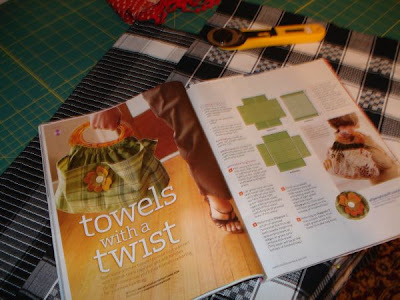 I saw this in the new issue, August 2008, American Patchwork & Quilting. I really like this little purse, we will see if I like it when it's finished. I will post later today pictures of the completed bag. There I said it, now I have to do it. 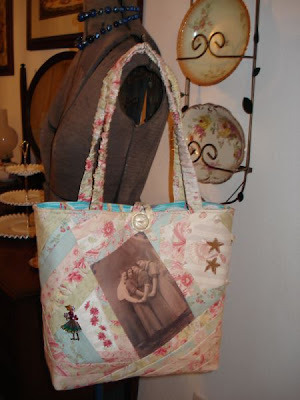 If any of you are going to sew this same purse, I will put your link up, for people to take a look. I think you can do so much with this, embellish, embroidery, etc... It is made out of 2 dish towels or fabric if you would like. 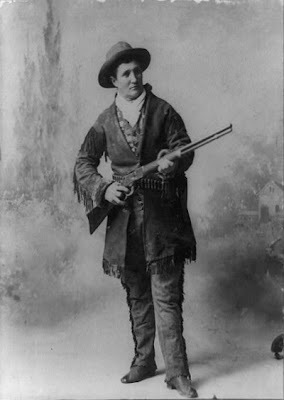 I lot of people have asked why I decided on the name Calamity Jane. 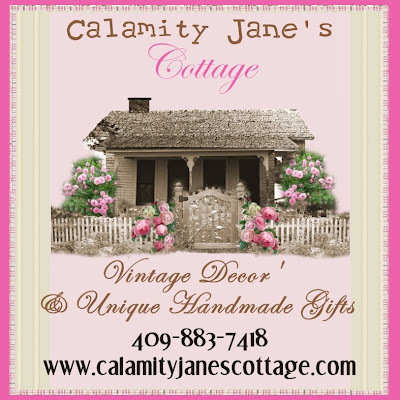 I have to tell you I love the movie with Doris Day playing Calamity Jane and they fix up the little cottage (that's the best part). The second is the picture that I'm going to post of her. Doesn't she just look like a strong Texas Gal, who can just about tackle anything. I have to post and get busy on the website so I will be back on Thursday(if I can stay away). 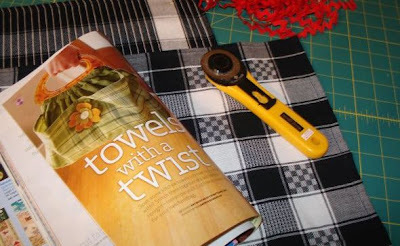 The excitement I read, like Miss Penny keeping us all in suspense and Cindy's redo's, the quilters and their projects and the inspirational is endless. I just don't know why I didn't discover this earlier. But my life was little bit busier with Canton Flea Market and getting products ready before the next month deadline. I hope to stay home and just be super busy here. I'm listing fabric now on the website. 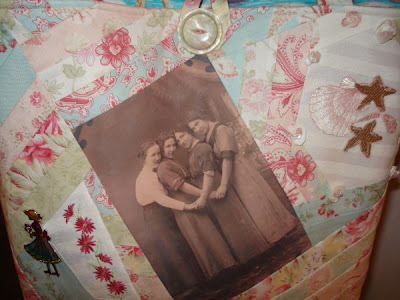 (I love fabric) The shop is going to be open soon with all the fabric, antiques and handmade items. Please stop by. I'm sorry that I'm late to let everyone know, but after Church we had a big dinner planned for the Dads and it was a little later than I thought. My two grand babies helped me out on this one and they were so excited. But I have two and they both had to draw. So, I'm giving away a second prize, which will be a surprise to the second person. Catherine or Cathy at http://cateslinens.blogspot.com/ Congratulations on the apron!!!! 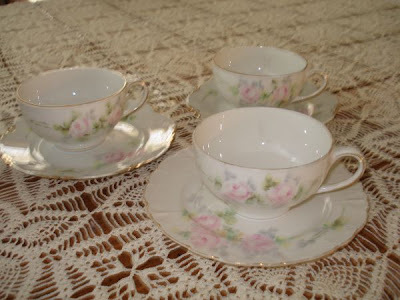 Sorry for the pictures-Miss Sandy at http://quillcottage.blogspot.com/ Congratulations on your surprise. I'll be contacting you both to get your address and I appreciate all of you that entered. Be looking for other giveaways. Thank you so much. I am so excited about the response on the apron giveaway. I'm going to have to do this more often. With the website being new, I have really been busy taking pictures and trying to decide what exactly to put on the website. The magazine ad comes out next month. I really like the blogs that puts a to do list on them. I think that would make me feel better, seeing it marked off. I'll have to figure that one out. I'm going to post some pictures of items that will not go on the website at this time. If you are interested just send me a post. 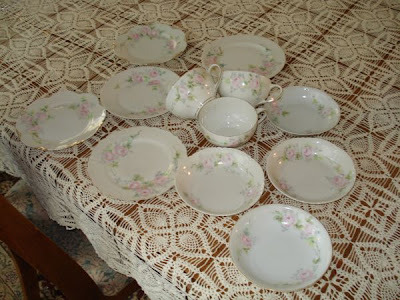 The dishes I've pictured are some odd n' ends (Bavaria Germany) pink and green floral, no chips or cracks. 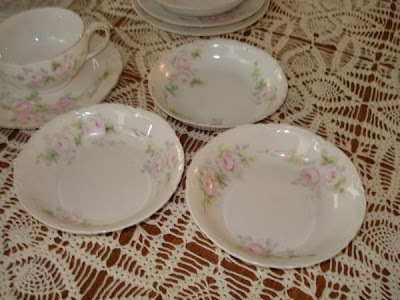 We have 3 cups, 3 small gold rim plates, 3 decorative bowls, 2 small bowls and 1 small plate (12 pcs). I'm putting the 12 pieces for $40.00 if anyone is interested just leave me a post. The apron is one that I had made with 4th of July colors, so whoever wins, will look great cooking Bar-B-Q for the family. 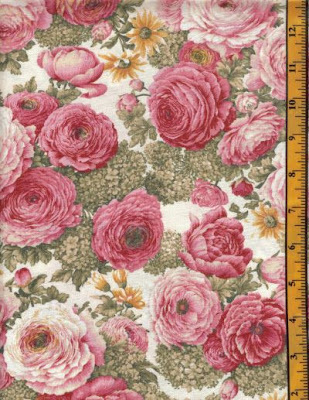 It has cherry's and flowers in the print. Just send me a post if you would like to be included. Good Luck to everyone. Drawing will be one week from today. I think Sunday is a great day to give something. I'll let my grandbaby draw late in the day so you can enter until 4:00pm on Sunday. Spread the word. Oh my, I forgot my dress!!! 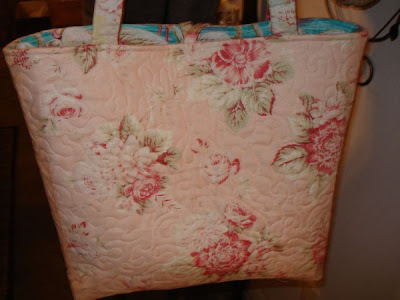 This is a purse that is posted on the website http://www.calamityjanescottage.com/ it is made out of a vintage tablecloth. I only cut into ones that have holes and it can't be used. More pictures are being posted daily to the website and I have an ad coming out in the August issue of Romantic Homes magazine. 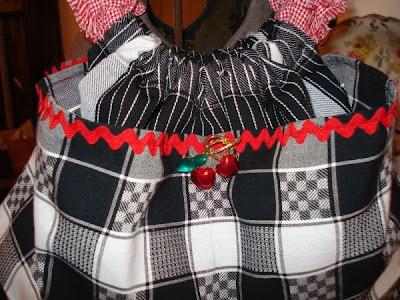 OK Girls, tomorrow I'm going to post a picture of an apron to be given away. "Details Tomorrow"
Ya come back now, you here!!! !